Buck Buckles put up hay in the Nebraska Sandhills using old-fashioned horsepower. Buckles is inspired by the horses her husband drives. Joan's son, Jerry Buckles team roped in the National Finals Rodeo. She painted this picture from a photograph of him. 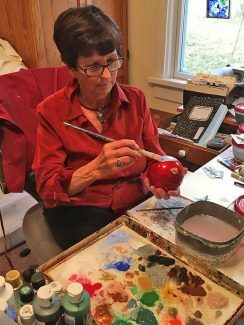 Painting is more than a hobby for Nebraska's Joan Buckles. The 37th annual open house will be held December 8-9, 2017, at Hinns Home Furnishings on Main Street in Gordon. Whether you live on a ranch, or your hobby involves horses, or you just enjoy the western lifestyle, chances are your home décor reflects a penchant for the west. 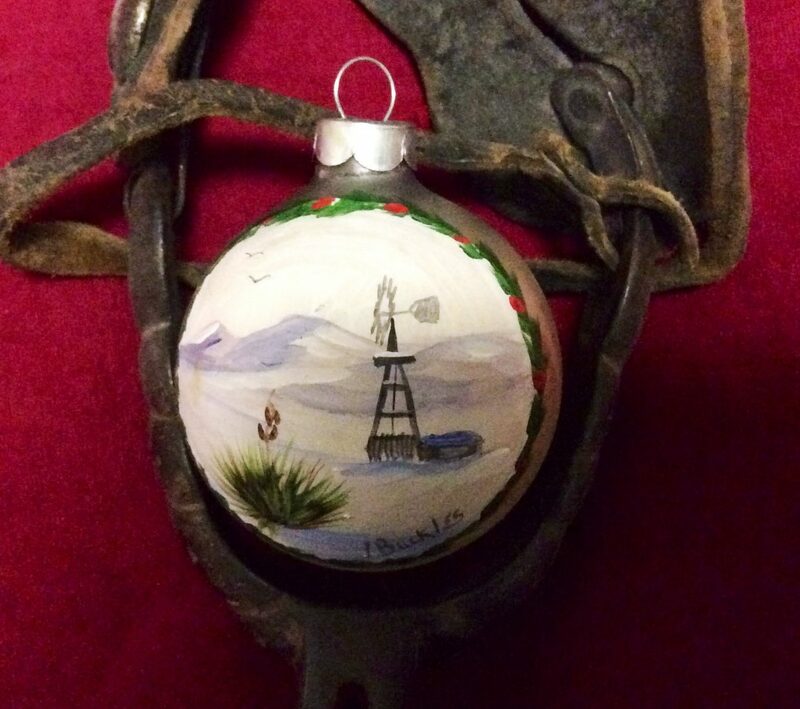 Holiday decorating often follows along this line, but it can be quite difficult to find western Christmas ornaments. Fortunately, the tri-state region is blessed with some outstanding western artisans who have filled that void by creating one-of-a-kind unique ornaments. One such artist is Joan (Burress) Buckles, a Nebraska Sandhills rancher's wife, who has been painting beautiful Christmas ornaments for a number of years. These items have become treasured collectables in many a home. Joan is no ordinary artist. 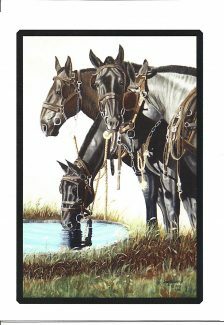 In fact, if you were to ask most horse enthusiasts from Texas to Canada what artist they feel can paint horses with the best accuracy and detail, many would be quick to answer, "Joan Buckles." 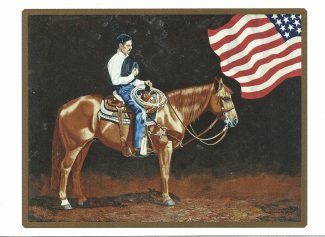 A self-taught artist, Buckles was born with a passion to paint horses. While a mere first grade student in a small country school in rural Sheridan County, Nebraska, she was mesmerized by a picture, "The Horse Fair," which her teacher, Jean Riggleman showed her in an art study class. 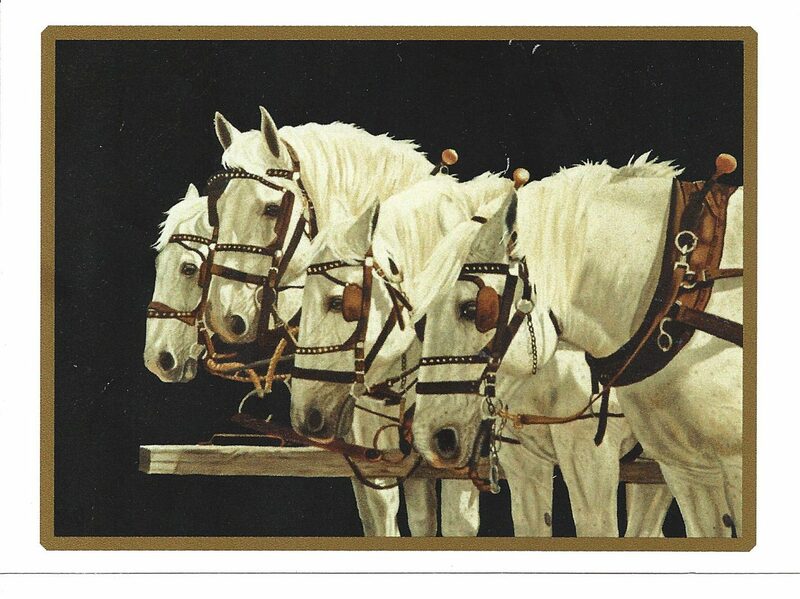 According to Joan, "Since that day, I always wanted to paint horses like that." After graduating from high school at the age of 16, she attended Chadron State Teachers College and began teaching a rural school at the age of 17. Country school teachers in the 1950s had to attend supplemental training and it was at one of these institutes, held in Valentine, where she roomed with another rural school teacher, Esther Buckles. Esther often talked about her husband, Jim, and son, Bucky. Eventually, Joan attended a Harry Evans dance at Gordon where she met Esther's son and the two hit it off. Joan Burress and Buck Buckles were married in July of 1957 and her marriage to this handsome cowboy gave her the opportunity to redefine her desire to paint, especially the horses that were a way of life for the young couple. After the birth of their three children, Joan joined her husband as he entered into hay contracts on large ranches in the Sandhills, which were all done by horse power. This unique operation found their young son, Jerry (beginning at age 8) driving his own team, while the two younger daughters, Julie and Joni helped Joan in the cook shack. The cook shack was literally a horse-drawn shack on wheels that housed a gas cookstove and also contained a converted washer to do the laundry. Camp usually was set up near a creek, and after the crew was fed and dishes done, Joan would often be found on the north side of the cook shack creating art while the girls played. The three gals would also spend valuable time together picking sand cherries or chokecherries, making jelly and exploring lots of fun things. All the while Joan found time to paint. The Buckles' home for the past 50 years has been on the Sanders Ranch in Western Cherry County, the birthplace of Buck, where hay has been harvested and cattle fed by the use of horses, often the subject of Joan's paintings. It was not long after Joan Buckles began painting horses and little western scenes on glass Christmas balls for her own enjoyment that requests started coming for her to paint these wonderful decorations for others. In addition to special orders, Buckles began designing and painting a special design for each year, and has held an open house with a fellow equally talented artist, Charlene Hare, on the first or second weekend in December at Gordon.